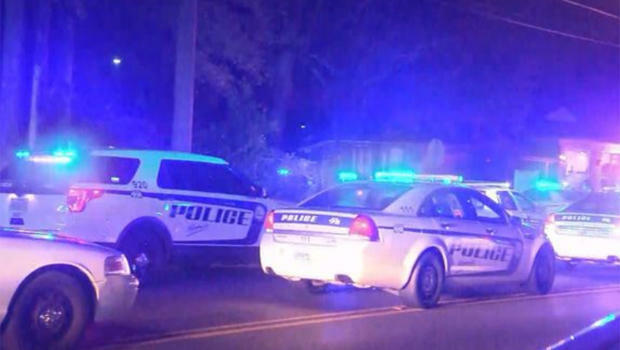 MOBILE, Alabama -- A Mobile police officer was shot late Tuesday and rushed to the University of South Alabama Medical Center, where he died, reports the CBS affiliate there, WKRG-TV. SWAT teams arrived around 12:30 a.m. Wednesday after a man barricaded himself in a home, authorities said. At roughly 2:45 a.m, police told WKRG the barricade situation "has been resolved." Suspect, Robert Hollie, has also been pronounced dead. It’s unclear at this time if it was suicide or if he was killed by police. The slain officer was identified as Justin Billa. Mobile Police Chief Lawrence Battiste said officers investigating the Tuesday night death of Fonda Poellnitz had identified her ex-husband, Robert Hollie, as a person of interest. He said Hollie opened fire on officers who had set a perimeter around his Toulminville residence, striking Billa. Battiste says at least one officer fired shots at the scene, but it's unknown if they struck Hollie. Fonda Poellnitz, the daughter of Octavia Poellnitz, told WKRG, "He didn't love my momma."